A Lease (or Rental) Agreement is covered by restrictive rent control laws. The amount of rent that can be charged is determined by a formula devised by the local executive, legislative or judicial government, as the case maybe. For Delhi, the maximum annual rent is 10% of the cost of construction and the market price of the land, but the cost of construction and the price of land are both based on historical values and not the current market valuation. So, the older the property, smaller the rent a landlord can charge. Rents can only be increased by a fraction of the actual cost the landlord has incurred in improving the property which he should inform the tenant about beforehand. Since Lease and License Agreements are designed to escape restrictive regulations, all terms are governed by agreement between landlord and tenant. Aside from the most basic condition that the tenancy is only for 11 months, everything must be stated in the contract. A tenant can be a contractual tenant or a statutory tenant. A contractual tenant is someone who occupies the premises and is entitled to the possession of the premises during the term of the contract. While a statutory tenancy comes into existence where a contractual tenant retains possession after the contract is terminated. 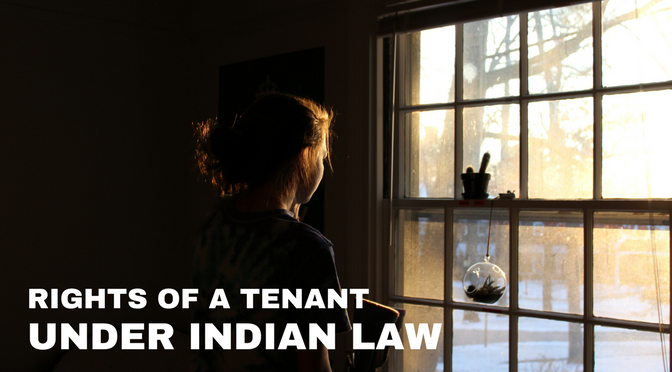 In India, across states, we have heard of numerous instances of harassment either by a landlord towards the tenant or vice-versa. This article aims at offering information about the rights of tenants and how they can protect themselves from a troublesome landlord. A tenant has the right to a house that is fit to be lived in. Unsafe conditions, such as holes in the floor, plaster coming down from the ceiling, bad wiring, and the like are considered unfit. It is the landlord’s responsibility to see that the house meets the minimum standards of accommodation. As per the law, a tenant should be fully informed of all the contents, terms and conditions of the contract and only upon the consent of the tenant can the agreement be signed by both the parties which then becomes a valid document. Both the parties will have to maintain a copy each of the agreement all the time. The tenant is also entitled to have appropriate contact information (telephone numbers, email addresses, postal addresses, etc.) and the landlord can be contacted at any point of time. The tenant has the right to privacy. The landlord cannot walk into the house without prior permission or information unless there is a true emergency like a fire or a flood in the bathroom. It is considered unlawful for a landlord to disconnect essential services such as electricity and water or restrict a tenant from using common amenities for recovery of rental dues or for other reasons. If a landlord executes any such brutalities, the tenant can approach the Rent Control Court to restore essential services and act against the landlord. If the landlord harasses the tenant by asking to evict the premises without any lawful reason and fails to accept rent, the tenant can first issue a notice in writing to the landlord, asking for details of a bank into which the tenant can directly deposit the rent to the credit of the landlord. If the landlord fails to respond, the rent can be sent via money order to the landlord. If this attempt to pay the rent also fails, the tenant must immediately file an application before a Rent Control Court to deposit further rents in court. As far as eviction is concerned, the landlord would have to file a petition before the competent Rent Control Court to seek eviction of the tenant. Under the Rent Control Act, landlords can evict tenants only under specific grounds, which include willful default in rent payment, subletting without the prior consent, causing nuisance or when the landlord himself requires premises for personal occupation. The tenant is entitled to reimbursement for any repairs that he/she carries out that are the landlord’s responsibility. The tenant is entitled to have visitors to stay overnight or for short periods, unless specifically forbidden in the tenancy agreement. The landlord must be informed if the tenant has an extra person moving in. The landlord must return the deposit to the Tenant at the end of the lease term with interest set by a statute. Legal heirs of the tenant are also tenants and is entitled to receive all the protection available to the tenant under the Rent Control Act of various states. However, it is the choice of the legal heir if he wants to renew the contract with the landlord and continue to stay. The tenant is entitled to refer any disputes to the Residential Tenancies Board (RTB) without being penalized for doing so. A tenant has the right to a copy of any register entry held by the RTB dealing with tenancy. All homes for rent must have a Building Energy Rating (BER) stating how energy-efficient the home is. This will help the tenant make an informed choice when comparing properties to rent. It is relevant to note that in the case of contractual tenancy, which is granted for a specific period, the landlord will not be entitled to apply for possession of the building for his own bonafide additional accommodation. However, it is necessary for the tenant to establish contractual tenancy under a registered rental agreement where registration is mandated. With knowledge of these rights, a tenant can enjoy a perfect living at the house. It is worthwhile if some of the important rights of both landlord and the tenant are highlighted in the contract. A simple step like that can save from many complaints, law suits and harassment. my landlord has sold the flat, the new owner is asking for immediate possession, i am aksing for 2 weeks notice period, what is my right? I have paid rent till 31st May, and deposit is still with the old landlord, however we do not have a rent agreement this is just mutual understanding. It is not even a month since I have moved to this flat and it was a huge money which I spent in shifting(includes 2 months security deposit, 15 days brokerage, packers and movers, installation charges of all households). now I got to know that my landlord has put the apartment on sale and i might have to vacate in a month or two.. what to do?. Neither broker nor landlord indicated any such thing earlier else I wouldn’t have shifted to this house. Please suggest what are my rights in this case. Hi, houses above 3500rs rent are not covered under rent control acts. So what is the remedy for such tenants? Owner is not giving electricity bill and verbally asking more than valid money in the name of electricity ….what step can b taken then ? I want to know, as a tenant, when is the maintenance fees payable for the property? My society is insisting on an upfront maintenance charge. Can you point me to the right law regarding this. Pls suggest what are provision ? So my previous landlord has refused to share her PAN card details, as she does not pay tax on the rent received. I on the other hand, had submitted information of the rent to avail income tax rebate in my office. Hi my agreement for new flat starts from 10th March, deposit has alrdy been paid, now the estate agent calls 2 days prior to handing out the keys and says that the land lady wish to shift herself in dis flat and wants to terminate the agreement, under dis scenario wat action can be taken against the land lady? Wat r my options as on 10th by any how I need d flat?? ?